Buying custom ready to assemble (RTA) cabinets online is more simple than ever using Barker Cabinets. We offer simple and easy to use layout tutorials right here on our website, streamlined online ordering, and fully customizable RTA cabinet sizes. Our cabinets are built to last using only the finest quality lumber and American made components. Combine this with our frameless and full overlay cabinet construction method and you have a superior cabinet product for your new project. What more could you ask for in a custom RTA cabinet line? It's easy to get started designing your project with our RTA cabinet line. Check out our online cabinet layout tutorials to see how easy it is to begin designing you project using our high end RTA cabinets. Layout and assembly is extremely simple and can be performed by virtually anyone! Ordering RTA cabinets is easier than ever. We offer a state of the art website for placing and tracking all orders. Compile your RTA cabinets order at your own speed, check prices and play around with various options before you place your new RTA cabinet order. Ordering RTA cabinets on the internet has never been easier than this! Looking for customization of your cabinets? Our custom RTA cabinets are available with 1/4" size increments. Imagine the possibilities of maximizing your space and getting your custom RTA cabinet project so dialed in that you can reduce or eliminate all the unused and wasted space. This maximizes your storage in every cabinet without being constrained by limited size options. Our cabinets are built order and you can order them however you wish, have fun! Looking quality American made craftsmanship? We use only the best materials and cabinet components in our cabinets. 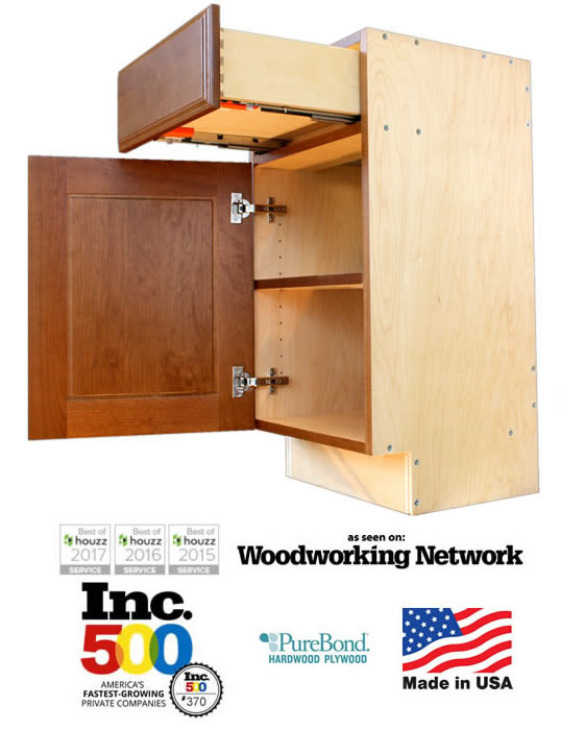 Purebond plywood cabinet cases (3/4" thick, formaldehyde-free, made in Oregon), Blum Blumotion drawer slides (full extension, soft closing, made in USA), Blum Blumotion hinges (soft closing, made in USA), and premium dovetailed drawer boxes come standard with every RTA cabinet we sell! Our cabinets utilize a frameless and full overlay RTA cabinet construction method. This results in a seamless and high end design that is impossible to rival using outdated construction methods. Combine a frameless and full overlay construction method with factory direct premium cabinet components and you will see nothing but beauty and longevity from your new RTA cabinet project. Enjoy your new RTA cabinet project from start to finish, order from Barker Cabinets today!